The HSD community on Discord is built in large part around alpha and beta tests of the original and 2.0 rules. Can a tabletop game be considered “canon?” I’m not sure. But certainly a campaign hosted by one of the official HSD Discord mods, with the game’s author at the table providing rule and color feedback in real time, gives an interesting lens on the development of the HSD world. Opening with a little hint about the future of Space Magic, TTI implements are becoming more common in Sol, a training wheel version of the nightmare implants from 1.0. Still part of the same world and same disaster, but more easily available. “That’s how TTI’s making all of its money, these little implants…TTI’s basically seeding Sol with these little things, for some unknown reason.” The episode also starts with a focused discussion of unique traits for each character–pet obsessions, focuses, that sort of thing. Sounds like a fun mechanic for uniqueifying your character. I’m pretty excited by this, as it seems highly player-customizable without being a danger to balance. Other stray thoughts — one of the characters in this episode, a “not appearing on stage NPC,” is a player character’s overprotective father. This one’s pretty adorable. 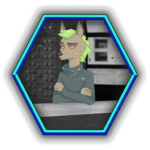 The PC is a cog named Lyra, and the doting father (a video journalist, VERY well-placed to embarrass the heck out of his child) is adorably doting. “Don’t worry, my little light bulb! Mumsy and pop-pops are coming to help you! Wouldn’t you be safer in a nice corp job?” We just wrapped up an episode about Cogs, and I wonder if a vector family would be quite this over-the-top loving. Cogs seem more involved with the idea of family in a way that makes them more living and real than Vectors, who, stacked side by side, are more like products than critters (again, compared to Cogs as a whole). This bit of silly family prattle feels very coggy, I liked this one a bit. it’s spread throughout the episode. I missed episodes 1-3 of “Lost Light,” so don’t really have a sense for the background of the game. There’s a very important lateral, and the wreckage of her pushframe (a humanoid suit smaller laterals can wear to negotiate a world built for human-shaped creatures) is a major plot element. From a plot-framing angle, it’s telling how a lateral can “become” her pushframe. NPCs don’t always have tons of personality, often we make do in our relationships with them more with details we’ve filled in than that the GM supplied, but it leaves me wondering to what degree laterals become their gear. Things to think about. A major plot element that we may want to look at in our show: what EXACTLY is a “Hot Zone”? In the rules, it’s loosely defined as a dangerous place where two hostile corporations border each other, which sounds to me like a bad neighborhood that might erupt in gunfire. In this session, a hot zone “erupts,” it’s a news item. And the journalists covering it don’t necessarily know who’s responsible. It sounds like a hot zone can be any region where two (or more?) corps are operating against each other, whether that’s a long, slow simmer like West Side Story, or a sudden flare of armed commerce by any means necessary. Maybe they’re like volcanoes–some erupt in brief flares, others last years and build weird, sharp-edged landscapes around them. I feel like we can expect some clarification of this in the upcoming Lorebook, but for now, nothing solid. Good wrap-up in the end which really emphasizes the sea of communication that vectors live in–the GM wraps up a plotline with an absent NPC with a series of “If you’re reading this…” style emails, videos, and so on, some intimate, some more surface. It makes sense that someone in this culture could have any number of triggered toggle messages for whatever eventuality could call them up. It’s also a good way to give each player a nod without seeming too artificial. Good device. Hey! I just wanted to drop you a line thanking you for leaving a comment way back when over on my podcast site. I keep meaning to come by and have a look at yours but… well… easily distracted! Hope you’re show’s going well! Aw, thanks! And to you too 🙂 There’s a lot to keep up with, glad to see you’re still making episodes!